An iceberg is ice that breaks off an ice shelf or snow-formed glacier and is floating in open water. They can be relatively small (less than 1 m [3 ft] high) to very large (over 75 m [250 ft] high). Very large icebergs (> 10 miles long) commonly calve from the Antarctic ice sheet. Since 2000, scientists have been tracking a series of giant icebergs that calved from the Ross Ice Shelf. Iceberg B15 calved from the ice shelf in March 2000 (see pictures below). One of the largest icebergs, it was approximately 170 miles long and 25 miles wide (nearly as large as the state of Connecticut, USA) when it calved. 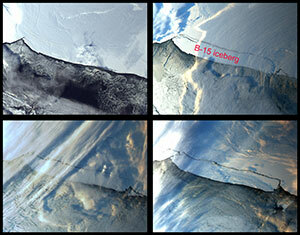 Over the first 12 months of B15’s lifetime, it broke into 9 pieces after colliding with the Ross Ice Shelf ice front. The largest fragment, B15A, drifted and collided with the Drygalski Ice Tongue in April 2005 (see picture below). B15A continued on along the Antarctic coast, leaving McMurdo Sound until it eventually broke into smaller pieces, some of which ran aground off Cape Adare in Victoria Land, Antarctica, in October 2005. It is thought that an ocean swell generated from a storm in the Gulf of Alaska 6 days prior contributed to the break up of Iceberg B15A. As icebergs drift, collide, and grind against each other (or the coast), they produce loud noises and vibrations. The vibrations register on seismometers as hydroacoustic signals called Iceberg Harmonic Tremors (IHTs) or “iceberg songs,” and typically last for up to several hours at a fundamental frequency of 1-10 Hz. These seismic signals are inaudible to the human ear, but can be heard if the recordings are sped up via computer processing. Loud noises produced by iceberg collisions, calving events, and ice cracking spread through the ice and into the surrounding ocean. Once the sound signal enters the surrounding waters, it can then travel long distances through the ocean with little loss of energy. 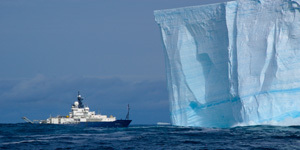 n mid-March 2007, the R/V Roger Revelle, a research vessel operated by the UCSD Scripps Institution of Oceanography, cruised by an Antarctic iceberg floating in the Southern Ocean. The iceberg is estimated to be 122 m (400 ft) in height. Photo credit: R/V Revelle Chief Engineer Paul Mauricio. Acoustic recording systems located far away from the Antarctic coast can listen to the Antarctic ice shelf. Scientists can use these acoustic sensors to monitor significant changes in glacial calving rates. One such system has already been deployed as part of the International Monitoring System of the Comprehensive Nuclear-Test-Ban-Treaty (CTBT). Each CTBT listening station consists of 3 receivers in a triangular array about 2 km wide. Each underwater listening station is cabled to shore so that data can be processed in real-time. Recordings from one underwater station off Cape Leeuwin in Western Australia have shown that Antarctica is the major source of low-frequency noise in the Southern Ocean and southern parts of the Indian Ocean.